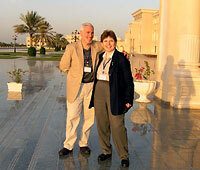 Prof. Steve Klein of George Mason University (USA) and IPJ director Magda Abu-Fadil at University of Sharjah. Prof. Nora Paul, University of Minnesota (USA) is former journalist and author of several noted books on online journalism. Sharjah is fast emerging as a hub for learning and knowledge. Abu-Fadil and Maha Taki, Westminster University (UK). College of Communication Dean Muhammad Ayish. Prof. David Weaver, Indiana University. LAU’s Institute for Professional Journalists director Magda Abu-Fadil spoke of “Online Media Ethics: A Needed Dynamic” by examing the proliferation of sites, blogs and outlets for citizen journalism and asking how countries could legislate for the Internet when one man’s proverbial meat is another man’s poison. She showed how mainstream media had abused their powers by distorting news and pictures and desmonstrated how different uses of captions online for the same picture could lead to disinformation that experts considered unethical. 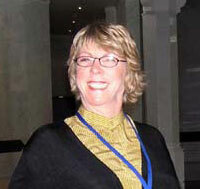 Her comments were presented in a paper at the conference “Online Journalism in the Arab World: Realities and Challenges” at the University of Sharjah’s (UAE) College of Communication November 22–24, 2005. The choice of content — whether or not to post offensive or traumatic material — was the subject of great discussion. What does a journalist do: help a victim or cover the news and photograph or shoot him/her in a disaster situation? Does one post video of hostages being kidnapped or killed online? Abu-Fadil concluded with a set of questions and recommendations to make journalists, ethicists and users of online media stop and think before embarking on their cyber quest for knowledge and communication. Social responsibility is an important backdrop for online journalism, according to Dr. Muhammad Ayish, dean of the College of Communication, who welcomed participants at the conference. The College has centered its academic programs on IT applications in radio, television and web-based instruction and training to familiarize students with the latest developments. The event addressed themes of Online Journalism Education; Effects, Audience and Exposure; Technologies; Economics and Management; Legal and Ethical Issues; Experiences in the Arab and GCC Countries; and, Development and Future. Indiana University (USA) Professor David Weaver spoke about the importance of new media in promoting understanding between peoples, noting that good information and good science needed accurate content. He said that while some people believe journalism was an academic field unto itself — deserving significant theoretical attention and study — others viewed journalism as a professional or vocational skill, not an area of deep theoretical import. Interactive abilities were not being capitalized upon, participants were told. Speakers called for full access to information but cautioned that speed may work against journalists who do not check their sources and hastily post online reports that have not been adequately verified. In discussing online journalism education, Dr. Ali Abusalem, Central Queensland University, Australia, said journalism students couldn’t afford falling behind technologically. He said more than half of Central Queensland University’s students study at over a dozen different campuses which are thousands of kilometres apart. To meet their needs, CQU developed unique, online journalism programs which can be accessed anywhere there via the internet; allowing for interactive discussions among widely disparate students, and drawing on databases and websites, rather than textbooks. George Mason University (USA) coordinator of the electronic journalism program Steve Klein demonstrated how his students participated in video conferences with guest speakers during class sessions and maximized the use of technological or online facilities. The ability to create sites, blogs and podcasts is a major shift from institutions to individuals, thereby enabling ordinary citizens to participate in the making of news, he said. “These are the tools of an internet-based and powered democratization of the media,” he said, adding that the average citizen has the potential to observe and report even more immediately than traditional media outlets. Online news content is more evolutionary than revolutionary, said expert Nora Paul who teaches at the University of Minnesota and has published several books on the topic. She explained that there was little support for research and development, a lack of training in new skills and that the newsroom culture was one of being in constant crisis mode. “For the most part, news websites continue to simply transfer the contents of the newsprint edition onto the computer screen — this is also known as ‘shovelware,’“ she observed. So she urged participants to start “rethinking storytelling” from explaining to experience, from informing to inviting opinion, from text to sound and image, from reading to playing, from columns to new navigation. Dr. Abdallah Kindi of Oman University turned the subject to the need for protection in Gulf Cooperation Council countries from online content deemed harmful to children. “Crimes are committed through, not just at, unsuspecting children,” he said. Some participants were adamant about the need for an online code of ethics in the Arab world. Others said the Web had developed at a dangerous pace and that Arabs had failed to keep up. Maha Taki of the University of Westminster (UK) said weblogs were becoming increasingly mainstream in most of the world. The University of Sharjah’s Mohamed Kirat discussed the use of electronic publications by public relations departments in the United Arab Emirates, to reach key publics online, gather information and monitor data to promote and develop ties with the news media. He presented a study showing that 24 organizations had a homepage, but that only two-thirds posted their publications on the Net and only a third used electronic newspapers to monitor media coverage, or gather key data for various tasks they performed.